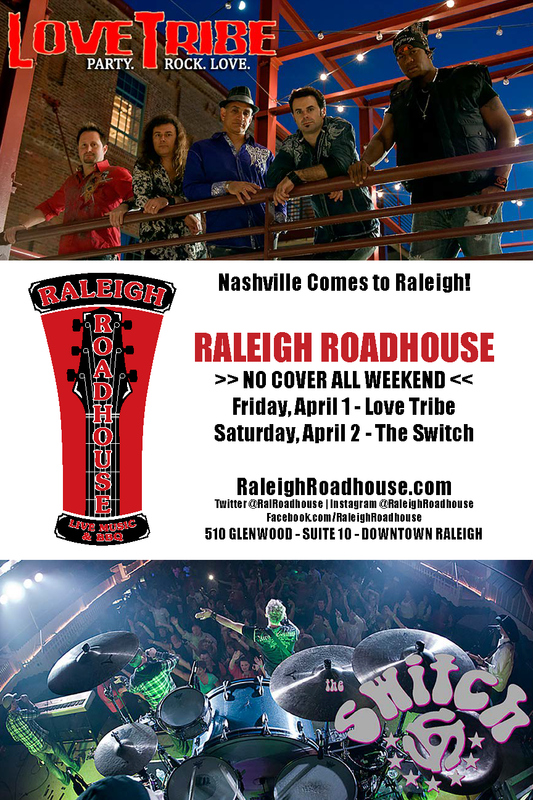 Partners Bobby Glass, Emil LaCivita, and Schaefer O’Neill have set Friday, April 1, 2016 and Saturday, April 2, 2016 as the grand opening weekend for the latest live music and restaurant concept, Raleigh Roadhouse. The partners have quickly turned around the ground level restaurant space at 510 Glenwood formerly occupied by Hi 5, Draft, and The Oakz. This is their second concept together, having also recently opened 510 Tavern in the space immediately above – formerly occupied by Big Boom. The new Raleigh Roadhouse BBQ restaurant and live music venue will feature a menu that is prepared fresh daily from never-frozen ingredients. Eastern and western pulled pork BBQ, ribs, brisket, homemade pecan pie, and other house-made southern staples round out the menu that can be previewed at http://www.raleighroadhouse.com/menu/ – with more coming under the direction of Chef Thomas Cullipher. For the grand opening weekend, regional party band favorites Love Tribe and The Switch will perform at 10 p.m. on Friday and Saturday, respectively.